Focus of the Week: This week we focus on whether there is a bubble in the Kenyan real estate market. To invest in any of our current or upcoming real estate projects, please visit Cytonn Real Estate. The Alma, which is over 55.0% sold and has delivered an annualized return of 55.0% p.a. for investors who bought off-plan. See The Alma. Other Relevant Updates: The Proceeds of Crime and Money Laundering (Amendment) Act, 2017 was signed into law on 3rd March 2017. The Act has introduced more stringent regulations to curb and penalize money laundering activities by both individuals and body corporates. In this note, our legal team evaluated the amendments and the steps to be taken to effectively fight money laundering in Kenya; See link. During the week, T-bills were oversubscribed for the sixth week running, with overall subscription coming in at 131.7%, compared to 209.5% recorded the previous week. The decline in the subscription rate could be attributed to the withdrawal of the 182-day paper from the auction market this week by the Central Bank. The move to withdraw the 182-day is aimed at management of maturities, by spreading maturities concentration risk evenly across the three papers. The 182-day paper has witnessed the highest level of subscriptions in previous auctions, averaging 334.0% in the last five auctions, compared to 83.8% and 100.4% in the 91 and 364-day papers, respectively, as it offered investors the highest return on a risk adjusted basis. The 182-day paper is also set to be withdrawn from the market in the next auction. Subscription rates for the 91 and 364-day papers came in at 97.0% and 166.4%, compared to 147.4% and 57.4% the previous week, respectively. Yields on the 91-day paper increased by 10 bps during the week to 8.7% from 8.6% recorded the previous week while yields on the 364-day T-bills remained relatively unchanged during the week, closing at 10.9%. The Central Bank (CBK) has remained disciplined in stabilizing interest rates in the auction market by rejecting bids that CBK considers as above market, and we have seen the market respond to this, as indicated by the overall bids received acceptance rate of 93.9%, compared to 71.6% at the beginning of the year. Given the possible upward pressures on interest rates, we maintain our recommendation for investors to be biased towards short-term fixed income instruments. The average interbank rate declined by 40 bps w/w to 4.8% from 5.2% the previous week, as the liquidity in the money market improved standing at net liquidity injection of Kshs 12.6 bn. The improved liquidity position during the week was supported by government payments, which came in at Kshs 38.6 bn from Kshs 23.5 bn the previous week, and a decline in Reverse Repo maturities to Kshs 7.7 bn from Kshs 20.7 bn the previous week. The volumes transacted in the interbank market decreased to Kshs 10.5 bn from Kshs 12.6 bn the previous week. According to Bloomberg, the yield on the 5-year and 10-year Eurobonds increased by 10 bps and 20 bps w/w to 4.3% and 7.3%, from 4.2% and 7.1%, respectively, the previous week. Since the mid-January 2016 peak, yields on the Kenya Eurobonds have declined by 4.5% points and 2.4% points, respectively, for the 5-year and 10-year bond due to improving macroeconomic conditions. This is an indication that Kenya remains an attractive investment destination. The Kenya Shilling appreciated marginally by 10 bps against the dollar to close the week at Kshs 102.6 compared to Kshs 102.7 recorded the previous week, on account of reduced dollar demand from oil and retail goods importers coupled with inflows from foreign investors seeking to invest in government securities. On a year to date basis, the shilling has depreciated against the dollar by only 0.1%. The forex reserves has now stabilized at about USD 7.0 bn (equivalent to 4.6 months of import cover) after declining from USD 7.8 bn in October 2016 (equivalent to 5.2 months of import cover), an indication of confidence by the Central Bank on the current trading levels of the shilling. The Central Bank of Kenya (CBK) and National Treasury through a memorandum on economic and financial policies to the International Monetary Fund (IMF), highlighted that the creation of the interest rate cap has made it difficult for the regulator to establish a formal interest rate corridor to improve liquidity in the money market. The inadequacy of the liquidity management framework has led to large banks holding on to huge deposits and lending to each other at lower rates, while the smaller banks have had to settle for higher interest rates to access funds. As highlighted in our Cytonn Weekly Report #3-2017, the average interbank rate increased in late 2016, driven by uneven distribution of liquidity in the money market. In order to cure for this, CBK is in the process of establishing a central collateral depository register to intervene in the interbank market and formulate a fair pricing mechanism for money market. According to the IMF, interbank rates deviated significantly from the Central Bank Rate (CBR) in 2016 reducing the effectiveness of the CBR as a tool of monetary policy. In its first review under the programme supported by the Stand-by Credit Facility last month, the IMF noted that the interest rate caps limit the effectiveness of the CBR and is prone to slowing the inflation-targeting framework that the CBK uses for monetary policy formulation and implementation. The liquidity in the money market is likely to remain skewed towards the large banks with the interest rate caps in place, as large banks continue to lend to each other at lower rates thus affecting the supply of credit in the market further, which will further affect the private sector credit growth that reached a 8-year low at 4.3% in the month of December, 2016. Our recommendation remains that rate caps should be repealed. East African Breweries Limited (EABL), has been granted approval by the Capital Markets Authority (CMA) to offer additional Kshs 6.0 bn worth of notes out of its Kshs 11.0 bn Domestic Medium Term Note Programme that was approved in 2015. The second tranche aims to raise Kshs 6.0 bn for general use and capital expenditure for the company. The first tranche issued in March 2015, was oversubscribed by 81.0% with total bids received amounting to Kshs 9.1 bn at a yield of 12.3% and is set to mature in March, 2018. The offer is set to run from the 13th March, 2017 to the 24th March, 2017 and is to be listed in the Nairobi Securities Exchange (NSE). This issue comes at a time when investors have expressed interest in the bond market, especially towards government securities due to favorable yields and thus this offer is likely to see investors demanding significant premium over the government securities, with a similar tenor Treasury bond currently trading at 13.4%. In our view, this bond issue has come at a time when the government has recorded poor performance in the most recent bond auction as a result of investors bidding at higher rates. Though the pricing supplement is yet to be released, we think it will only make sense for investors to demand a premium of atleast 2.0% above the prevailing yields on a 5-year treasury bond, which translates to a minimum yield of 15.4%. The issue also signals a reopening to the corporate credit market, with the last issue having taken place 16 months ago. The United States Federal Open Market Committee (FOMC) is set to meet on 14th and 15th March, 2017 to assess the current state of the US economy and shed light on a possible rate hike. During the Fed?s previous meeting held last month, the committee decided to maintain the rates within the band of 0.50% - 0.75% due to the heightened uncertainty brought about by the impact of the current administration on the economy. Previously, the Fed highlighted plans to accelerate its rate-hiking pace, hinting at 3 rate hikes in 2017 on expectations of an improved economic performance this year. We expect the Fed to raise the rates to a band of 0.75% - 1.00%, given (i) inflation, which rose 2.5% y/y in January above the federal target of 2.0%, (ii) a relatively strong labor market adding approximately 235,000 new jobs in February, from 238,000 in January, with the economy operating at a full employment, having attained unemployment rate of 4.7%, and (iii) a strengthening global economy. With the expected rate hikes, we are likely to see the dollar strengthen in the international markets causing volatility to the other currencies. The Government is ahead of its domestic borrowing for the current fiscal year having borrowed Kshs 188.1 bn against a target of Kshs 163.4 bn (assuming a pro-rated borrowing throughout the financial year of Kshs 229.6 bn budgeted for the full financial year). It is important to note, however, that the government is in the process of revising its domestic borrowing target upwards to Kshs 294.6 bn, which will take the pro-rated borrowing target to Kshs 209.6 bn, implying that the government will fall behind its borrowing target. The government has only borrowed Kshs 123.5 bn, of the budgeted foreign borrowing, representing 26.7% of its foreign borrowing target of Kshs 462.3 bn, and given Kenya Revenue Authority (KRA) has already missed its first half of 2016/17 fiscal year revenue collection target by 3.2%, and it is expected to miss its overall revenue collection target of Kshs 1.5 tn for the current fiscal year. This creates uncertainty in the interest rate environment as the government might have to plug in the deficit by borrowing from the domestic market, a move that may exert upward pressure on interest rates, and result in longer term papers not offering investors the best returns on a risk-adjusted basis. It is due to this that we think it is prudent for investors to be biased towards short-term fixed income instruments. During the week, the equities market was on an upward trend with NASI and NSE 25 gaining 0.6% and 1.1%, respectively, while NSE 20 remained unchanged, taking their YTD performances to (8.2%), (8.5%) and (7.0%), respectively. This week?s performance was supported by gains in select large cap stocks such as KCB and BAT, which gained 15.7% and 5.8%, respectively. 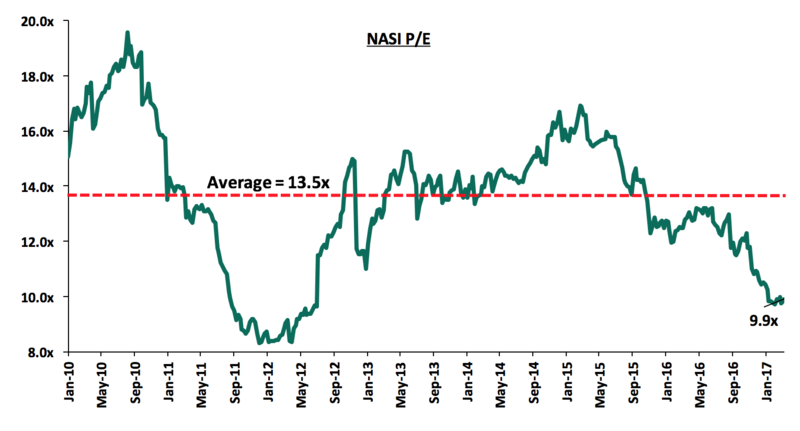 Since the February 2015 peak, the market has lost 46.1% and 31.0% for NSE 20 and NASI, respectively. Equities turnover increased by 85.2% to close the week at USD 23.2 mn from USD 12.5 mn the previous week. Foreign investors were net sellers with net outflows of USD 1.1 mn, an increase of 894.6% compared to a net outflow of USD 0.1 mn recorded the previous week, with foreign investor participation increasing to 82.8%, from 69.1% recorded the previous week. Safaricom was the top mover for the week, accounting for 56.4% of market activity. We expect the Kenyan equities market to be flat in 2017, driven by slower growth in corporate earnings, neutral investor sentiment mainly due to the forthcoming general elections and the aggressive rate hike cycle in the US, which may reduce the level of foreign investors? participation in the local equities market. The market is currently trading at a price to earnings ratio of 9.9x, versus a historical average of 13.5x, with a dividend yield of 7.0% versus a historical average of 3.7%. The current 9.9x valuation is only 19.3% above the most recent trough valuation of 8.3x experienced in December of 2011. The charts below indicate the historical P/E and dividend yields of the market. During the week, the Capital Markets Authority (CMA) announced its plan to come up with a tax framework for securities lending and borrowing that will ensure the product doesn?t alter normal trading at NSE. The product, which was proposed in October last year, aims to increase the liquidity in the market, especially on the corporate bonds segment. It involves temporary transfer of securities from one party to another with a formal agreement to return the securities at a pre agreed price either on demand or at an agreed time in future. Uneven taxes in a securities market can arise especially to investors looking to do margin trading or short selling and this can cause distortion by driving activity to one segment at the expense of the other. The move by CMA will ensure there is tax neutrality for those looking to borrow or lend stocks, so that they don't enjoy a tax advantage over other traders. This is a step in the right direction that will see improved activity in the corporate bonds segment that has for a very long period of time left corporate bond investors with no option but to classify the bonds as hold to maturity in their portfolio. The move also deepens our capital markets, which is essential for financing economic activity. The board recommended a final dividend of Kshs 3.0 per share, an increase of 50% from the Kshs 2 per share paid in FY?2015, equal to a dividend yield of 10.2% as at Friday?s closing share price of Kshs 29.5. KCB Group registered improved performance on loan book impairment, on account of recoveries made during the year on non-performing loans, which included 2 major clients. We expect the bank to continue with its aggressive approach in loan recovery during 2017, cutting down on expenses and in the process improving profitability. Continued implementation of cost reduction measures through adoption of digital platform and other alternative channels of distribution for both loan disbursement and deposit mobilisation. This will help the bank achieve efficiency and keep the cost to income ratio at below 50.0% levels. For a more detailed analysis, see our KCB Group FY?2016 Earnings Note. The board recommended a final dividend of Kshs 1.0 per share, which equals to a dividend yield of 4.1% as at Friday?s closing share price of Kshs 24.5. Going forward, NIC bank will thrive on increased efficiency through cutting down of costs by: (i) reducing redundant roles across all branches thus cutting down on staff costs, and (ii) exploring technology as a more cost effective measure in deposit collection and loan disbursement. For a more detailed analysis, see our NIC Group FY?2016 Earnings Note. Of the 4 banks that have released their FY?2016 results, all have recorded a decline in core earnings per share, with the average decline in core earnings across the banking sector at 5.4%, owing to the tough operating environment as a result of the interest rate caps and higher loan loss provision. In addition, the sector has experienced lower loan and deposit growth, with the only metric that banks have been able to protect so far being their Net Interest Margins. The Board proposed a final dividend of Kshs 0.3 per share, which equals to a dividend yield of 2.3%. As highlighted in our Cytonn Weekly # 11/2016, going forward we expect sustained earnings for the oil marketer given the focused expansion of the retail network through addition of new service stations, and the continued reduction of their debt obligations with the aim of reducing the cost of debt. Operating revenue grew by 8.2% y/y to Kshs 7.9 bn from Kshs 7.3 bn in FY?2015, which outpaced growth in operating expenses, which rose by 2.4% to Kshs 5.4 bn from Kshs 5.3 bn. The Board proposed a final dividend of Kshs 6.0 per share, which equals to a dividend yield of 4.1%. As highlighted in our Cytonn Weekly #10/2016, the future of the company will be driven by (i) on-going infrastructural developments in Kenya and the region, which will increase the company?s turnover and (ii) the company?s restructuring initiatives, which is expected to keep costs under control. BAT has also been placed under review because of its FY?2016 earnings. We will be meeting with management to discuss the FY?2016 results and the business strategy going forward in order to update our valuation. We remain "neutral with a bias to positive" for investors with short to medium-term investments horizon and are "positive" for investors with long-term investments horizon. TA Associates, a US-based global growth private equity firm, has acquired undisclosed minority equity interest in Interswitch, an Africa-focused integrated digital payments and commerce company that facilitates the electronic circulation of money as well as the exchange of value between individuals and organizations for undisclosed amount of money. Interswitch is a recognized leader in the payments space in Nigeria, where the company owns and operates the country?s principal domestic debit card scheme, Verve, as well as serves as a third-party transaction processor for most of Nigeria?s largest banks. Interswitch currently operates in Nigeria, Gambia, Kenya and Uganda. Helios Investment Partners remains the majority shareholder of Interswitch. This transaction is underpinned by: (i) Interswitch leading position in the emerging marketplace, especially in debit cards, which comprise 99% of all cards in Nigeria, (ii) strategic partnership and alignment of Interswitch interests with key banks, merchants and other institutions, thus making it a leading provider for payments solutions in an emerging and rapidly growing market in Nigeria, (iii) alignment with Interswitch efforts of consolidating the impact of their services and increasing financial inclusion as well as its expansion plans into other markets in the African continent and, (iv) TA?s domain expertise in the payments space and its global reach will be of benefit to Interswitch?s goal of digital payments evolution. Actis, a leading growth markets investor, raised USD 2.8 bn in capital commitments for its fourth energy-related fund surpassing the USD 2.0 bn target. The fund was raised by Actis? in-house team and was significantly oversubscribed in just seven months into the market. Actis Energy 4 (AE4) fund will invest in select countries in Latin America, Africa and Asia targeting investments in electricity generation businesses offering scale, diversification, growth and market leading high growth electricity distribution businesses. This transaction is underpinned by high and rising demand for electricity and quality infrastructure in growth markets. According to research by Actis, the demand for new investment within the electricity sector is USD 1.5 bn every day with renewable energy generating USD 0.5 bn of investments per day in non OECD countries and an estimated USD 10 tn of investment is required by 2035 across non-OECD countries to meet the growing demand. Private equity investment into Africa increased in 2016 by 52.0%, according to the latest data from African Private Equity and Venture Capital Association (AVCA), with a total of 145 deals worth USD 3.8 bn compared to a total deal value of USD 2.5 bn in 2015. Sectors that recorded an increase in deal value include; Financial services, FMCGs, Utilities, Energy and telecommunication services. The increasing investor interest is attributed to rapid urbanization, a resilient and adapting middle class and increased consumerism. Going forward, the increasing investor interest and stable macro-economic environment will continue to boost deal flow into African markets. Private equity investment activity in Africa has continued to improve, as evidenced by the increase in the number of deals and deal volumes in the region. Preference this week has been skewed towards the financial technology and energy sectors. We remain bullish on PE as an asset class in Sub-Saharan Africa given (i) the abundance of global capital looking for investment opportunities in Africa, (ii) attractive valuations in the private sector, and (iii) strong economic growth projections, compared to global markets. Higher levels of experience, skill and execution since most of them are international companies with years of experience in both real estate and infrastructural construction. According to the just released 2017 Knight Frank Wealth Report, Kenyan Chapter, Real Estate is getting the bulk of investments by high net worth individuals (HNWI) at 28%, against 20% invested in personal business and 18% invested in equities and precious metals. The report further highlights that the number of dollar millionaires grew by 10.6% from 8,500 in 2015 to 9,400 in 2016, and this is expected to further increase by 79.8% in the next decade to 16,900 people. The thematic distribution among those investing in real estate is 63% residential, 56% commercial office, 31% retail, 25% in leisure and 13% industrial. With the continued poor performance of the stock market, reduced interest rates, increased demand for residential units by the middle class as well as government initiatives such as tax cuts to large-scale developers, we expect increased investments in the real estate sector and not just by HNWI but also by the middle class. The Board of Registration of Architects and Quality Surveyors of Kenya (BORAQS) unveiled a five-year strategic plan that aims at improving professionalism in the sector by harmonizing practice standards, setting up an examination body to ensure the practitioners are well qualified and to have a one stop shop for environmental, public health, water, and physical planning functions. The plan thus aims at improving on the quality of buildings in Kenya and easing the approval processes for developers seeking clearance. The body will also test the quality of building materials such as the Alternative Building Technology (ABT) that is currently gaining traction in Kenya. Also included in the strategic plan were new regimes such as: manuals for use by architects and quantity surveyors, an e-payment product, and BORAQ Visa which will soon be the sole payment platform for construction services and a reviewed training curriculum for the building sector in tertiary institutions. In our opinion, this is a positive move as it will reduce the number of quacks defrauding players in the construction industry and ease the approval process which has been tedious and involving different permits form different bodies in different locations. During the week, Johnson and Johnson the manufacturer of medicinal, pharmaceutical and personal hygiene products announced that it will set up its East African Headquarters in Nairobi citing political stability, government support, established distribution channels as well as an educated and entrepreneurial population as the key reasons behind the decision. Other multinationals that have recently announced plans to set up offices in Nairobi include Volkswagen and Wrigley?s. This influx of foreign investors in Kenya will increase demand for Grade A offices, which are currently in low supply and hence boost the returns from the current average rental yield of 10.2% and occupancy of 85.6%. Increased investment expected in real estate across all themes boosted by the high returns being earned in the sector, increasing incomes, improved security situation in the country and positioning of Nairobi as a regional hub as regulators work on ensuring quality products are delivered to the market. Focus of the Week: Is There a Real Estate Bubble in Kenya? Over the last decade, Kenya has experienced a Real Estate boom with prices rising rapidly amid high demand from both long-term investors and speculators. Over the last 8 years between 2007 and 2015, the average price of a one to three bed room apartment has risen from Kshs 5.2mn to Kshs 13.4 mn, translating into a compounded annual growth rate (CAGR) of 14.5%. This has led some participants in the real estate market to wonder whether the rise in property prices is a bubble that is likely to burst in the near future. This week we thus seek to identify whether there is a bubble in the Kenyan property market. We start by defining what bubbles are and their characteristics, we then look at major property bubbles that have been experienced before, focusing on the causes and how they burst, and finally look at the key metrics in Kenyan property market to gauge whether there is a bubble, we then list conditions precedent for a bubble to be witnessed in the Kenyan market and finally conclude with an outlook for the real estate market. Disruption in the credit market, which leads to an increase in interest rates leading to an increase defaults levels and non-performing loans, which exposes the banking system. This results into reduced credit supply, and hence demand suddenly falls leading to a sharp fall in prices, and hence loss of value for homeowners, speculators and banks, and the bubble is said to have burst. Having looked at what real estate bubble is and its characteristics, we now turn our attention to case studies of United States and Ireland, which experienced bubbles that eventually burst between 2000 and 2008. On the busting of the bubble, the whole system was deleveraged leading to widespread foreclosure by banks. The banks could however not recover their money due to drop in property prices by up to 50%. The result was that banks became bankrupt such as Lehman Brothers. This further resulted into unemployment, decline in purchasing power and consequently the economy experienced a recession again, this time a deep and protracted recession, hence the Great Recession. Poor regulation of the banking system: Irish banks were borrowing internationally to fund the high demand for mortgages, which they were financing up to 100% and giving up to 10 times an individual?s income with no proper collateral. When the global financial crisis hit Europe, Irish banks liquidity was curtailed and they were unable to lend to the population resulting in reduced demand in an oversupplied market. Then Eastern European Nations joined Euro and their economies picked up leading to most of the foreigners leaving Ireland. This resulted into a sharp fall in demand and hence a decline in prices for houses. The two case studies follow a similar cycle ? there is increased investment in real estate as it delivered higher returns than other asset classes, real estate prices increase in response to the increased demand and investment leading to boom period which creates a period of irrational excitement with people demanding and taking credit to purchase houses. A disruption then occurs mostly in the credit cycle leading to reduced demand in an oversupplied market. Large Housing deficit that stands at 200,000 units per year. So how do we know that the current demand is not fueling a property bubble? Here we look at several economic fundamentals that characterize bubbles. There must be a constraint in the land supply in the market either through increased development or zoning regulations, currently the supply is sufficient and most restrictions on developments are being relaxed to facilitate construction. In addition to the above factors, the Kenyan real estate market is still in its nascent stage and is just being institutionalized. A real estate bubble typically occur in well-established real estate markets. The Kenyan market is thus not experiencing a bubble but the normal real estate cycles of rising demand, peaking market, falling market then bottoming out and the rapid price increments witnessed are because the Kenyan real estate market is in the rising phase that is characterized by low supply, high demand leading to an increase prices. When supply matches the demand, we are likely to experience cooling off of prices and higher vacancies as some sub markets have started showing. Largely the Kenyan real estate market remains a developer?s market. Disclaimer: The views expressed in this publication, are those of the writers where particulars are not warranted. This publication, which is in compliance with Section 2 of the Capital Markets Authority Act Cap 485A, is meant for general information only, and is not a warranty, representation, advice or solicitation of any nature. Readers are advised in all circumstances to seek the advice of a registered investment advisor.